After visiting and meeting many industry friends and associates in Australia when I spoke at FILEX in 2010, I knew I'd enjoy visiting there again one day. FILEX is such a great event, and Nigel and Lisa Champion do such an outstanding job with the conference. I highly recommend it for anyone who can attend. 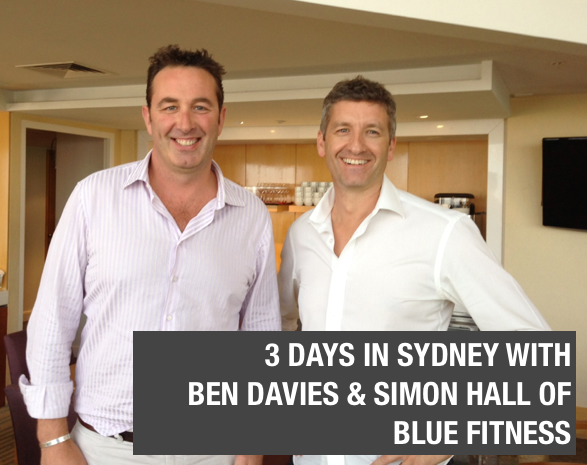 Unfortunately for me I had only 3 days the week before our US thanksgiving recently and a lot on my plate with Ben Davies and Simon Hall of Blue Fitness, among a few other important tasks. Among the many things Ben and his company does, supporting and distributing Star Trac Fitness products is one of the most important. With the approaching launch of the treadclimber and other products, the market for Star Trac is really starting to heat up there. With a background that started with YMCA operations in Auckland, NZ, another connection we shared because of his familiarity with New Zealand based Les Mills , Ben has a broad grasp of fitness and recreation facility management, operations and marketing. I'd also collaborated with Simon Hall before during his tenure at EZ Pay . It was great seeing them and others during the brief trip and it brought to mind an important question I had thought about during my previous visits. What is really interesting to me is how incredible the NZ and AU fitness and health club market are. With a population of 23 million in Australia and another 4.5 million in New Zealand the impact of their marketplace is felt around the world. There are so many professionals and influencers in the club business that created brands and are a part of the global landscape of fitness and wellness its really amazing. Les Mills is one and leaders like Mark Smith, Tony de Leede, Geoff Dyer, Nigel Champion, Phillip Mills, Sarah Robb O'Hagan and many others (my friend Laureta Stace for one) , is exceptional. I think that given the continued rise of the Asia Pacific these markets and the leaders born from them will continue to have an increasing imapct on the global marketplace. Do you agree ? Tell me, Bryan O'Rourke, why do you think the Australian and New Zealand markets have such a profound influence in the health club industry ? Do you agree with this thesis ? What do you think is the reason for this ? I look forward to your thoughts. Bryan O’Rourke is a health club industry expert, technologist, financier, and shareholder and executive in several fitness companies. He advises several successful global brands, serves as a member of the GGFA Think Tank and serves as CEO of the Fitness Industry Technology Council. To learn more contact Bryan here today .